Is the monome connected directly to Bela? Is it a USB device? Does it show up when you run lsusb? Some work has been done to get the Monome to work on Bela (though not with Pd): https://forum.bela.io/d/240-monome-grid-bela, and it seems that you need some extra software besides Pd. The last post there makes a reference to the need for serialoscd to be running for the Monome to work? Do you have something like that (or some dedicated software?) running on the host that you don't have on Bela? 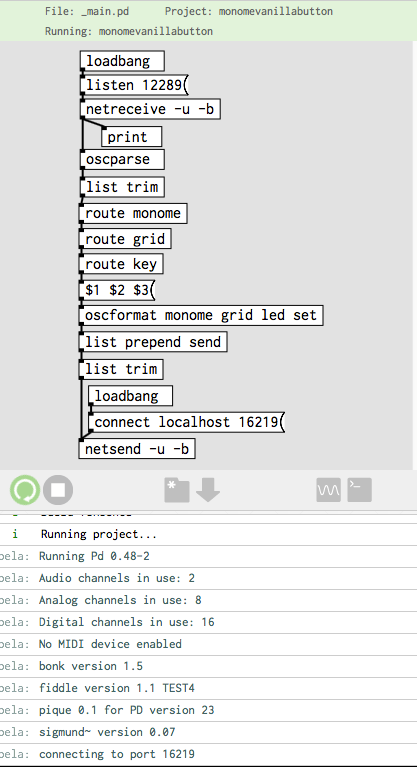 Judging from the name of the program (serialoscd), I'd assume the Monome should show up as a serial interface on Bela? Does It? try: ls /dev/tty* with and without the Monome connected. Many thanks Giuliomoro for your help. Yes, the monome is a USB serialosc device, is connected directly to the Bela and it shows up when I run ls /dev as ttyUSB0 ... and it even reacts when I run screen /dev/ttyUSB0 connected to the Bela. Among the several discussions I checked out I was using the script from padenote bela-setup-monome.sh in the discussion you also mentioned https://forum.bela.io/d/240-monome-grid-bela to install libmonome and serialosc in the Bela, and to run serialoscd on the bela boot ... so, I thought it was properly installed and running, but it seems like actually it wasn't. But (silly enough) I still don't know if I have to run serialoscd in order to make the monome connection active or serialoscd is just a program to monitor if the monome is connected. txarliema so, I thought it was properly installed and running, but it seems like actually it wasn't. That's expected: we wouldn't necessarily install on our image everything that is reported to be working with Bela. txarliema But (silly enough) I still don't know if I have to run serialoscd in order to make the monome connection active or serialoscd is just a program to monitor if the monome is connected. I know nothing about it, but I would guess that serialoscd is a bridge between OSC and the monome: my guess is that it receives OSC messages from the user application and passes them over to the monome over serial, and also receives serial from the monome and passes it on as OSC to the user application. So, I guess it has to stay open throughout for the program to work! txarliema or how to combine the C++ program to run serialoscd and my puredata patch. that C++ program is really just doing the equivalent of starting serialoscd. You can replace it by starting serialoscd manually in a separate terminal (or in the console at the bottom of the IDE). These lines in padenot's script set serialoscd as a systemd service that will run automatically every time you start the board. 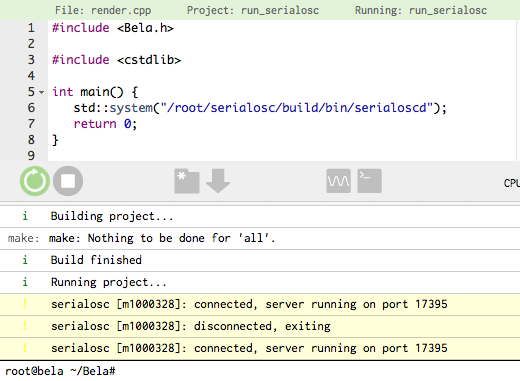 Judging from your log, serialoscd seems to use 17395 by default, so that is what you should have in Pd. But again, for this to work you need serialoscd to be running at the same time, either manually starting it in a separate terminal (or in the IDE), or by setting it up as a systemd process. This is my understanding, judging from the information you provided and padenot's post, but without knowing anything about the specific program / hardware. giuliomoro txarliema so, I thought it was properly installed and running, but it seems like actually it wasn't. Good news!!! I'm almost there!!!! I accessed to the serialosc configuration ~/.config/serialosc/<your_monome_id>.conf. and found both port numbers for the netsend (8000) and the netreceive (17395). Then, and after running serialoscd, the puredata patch runs and comunicate perfectly between bela and monome through those correct ports. Any clue about how to combine C++ and PureData to run serialoscd, please? In every Bela program, there is a default main() function that takes care of parsing the command-line options and initializing and starting the audio engine. The user normally does not need to see this, however they can override if they so wish (for instance in order to parse custom command-line options). this effectively replaces the default main() function in the Bela code, so that the only thing that gets executed is this function of yours (as it contains no calls to the Bela_...() functions). As mentioned earlier, padenot's script does exactly this. giuliomoro These lines in padenot's script set serialoscd as a systemd service that will run automatically every time you start the board. making it executable and moving it to /lib/systemd/system/, and then calling systemctl enable serialoscd. Run the above lines once, and reboot: you should find out that serialoscd has already been started. To check its log, run: journalctl -fu serialoscd. I've got it working very good now with a C++ program combined with my puredata patch from BOOT. The systemd from Padenot I didn't try it yet, and I'm going to leave it for later, since now I prefer to develope the option of PD + C++ programs. When you paste code, please remember to enclose it in triple backticks (```). I edited your message above.